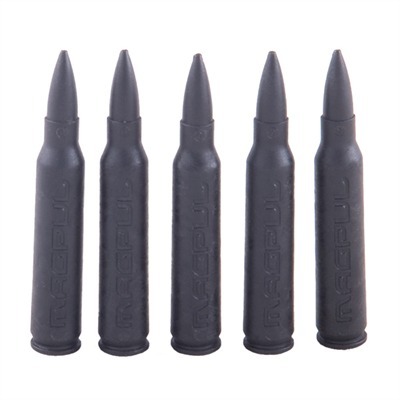 Solid, inert, dummy rounds let you safely test the feeding, extraction, and magazine function of your rifle without the worry of accidental discharge. Lets you dry fire without risking damage to the firing pin. Glass-fiber reinforced polymer material can't corrode or cause corrosion. Precision molded to duplicate the Remington .223/5.56mm NATO round in five critical dimensions, and can be cycled and ejected the same as live ammunition. Sold in 5-Paks. Mfg: Magpul SPECS: Fiberglass-reinforced injection-molded polymer, black.